Hey! This is Maya, Steph’s friend from school. As I await her visit, I reminisce on our beautiful, fulfilling days in the windy city. A big part of our lives at UChicago was biking around Hyde Park like a mini biker gang of two; it’s also one of the things I love doing in my neighborhood. Since I’ve been back, biking has been a great way for me to pretend to exercise and avoid chores at home while endangering the general public by attempting to simultaneously photograph the adventure. My best biking buddy is fashion enthusiast Olivia Culver! We’ve been friends for years which can only be explained by the mind control tactics I’ve been employing. Olivia won best dressed back in high school and I’d credit that to her eccentric, eclectic, edgy and always flattering style that was hard not to notice in a school like ours. She’s incredibly talented at utilizing thrift stores finds and layering accessories that make her outfits look effortlessly put together. Here she is looking supes playful and sporty, perfect for our bike adventure! 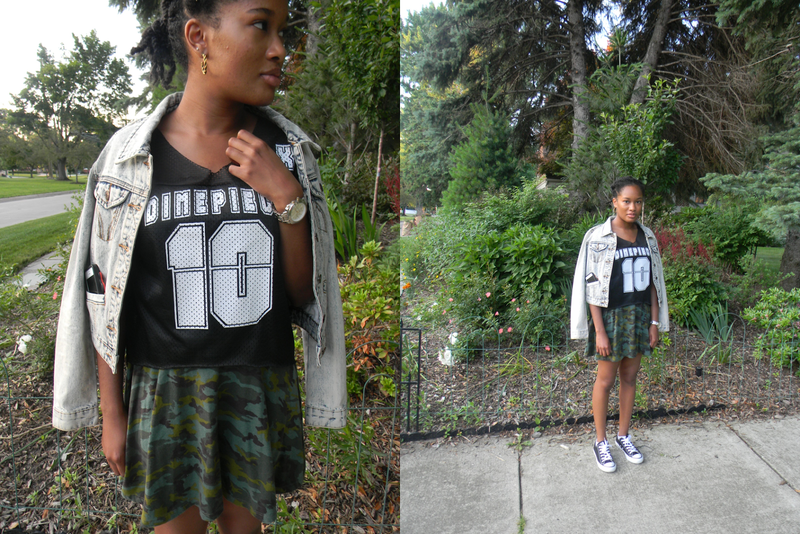 She’s wearing a Dimepiece jersey over a simple a-line camo tank dress from Urban Outfitters. The oversized shirt and loose skirt plays with a kind of juvenile theme which is accentuated by her converse. We agreed the outfit could have had a vastly different vibe were the shoes changed, a pair of wedged sneakers for example would make it more of a “going out” look. 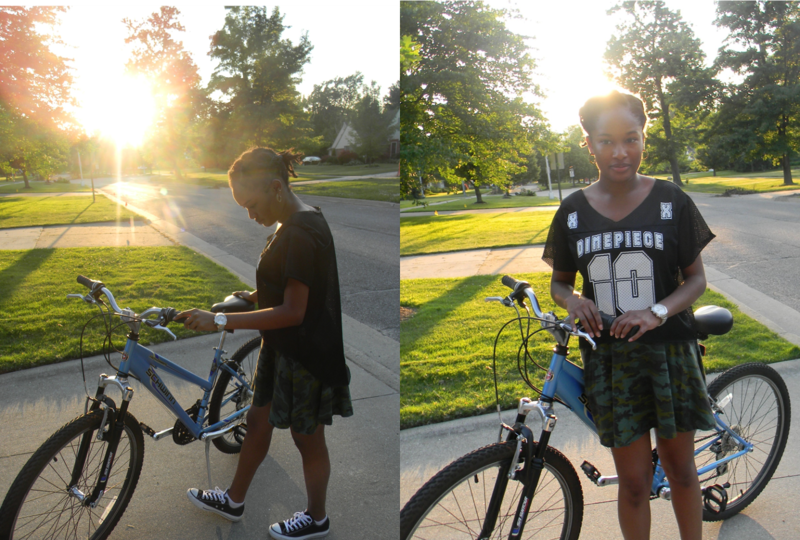 For the purposes of our simple bike ride though, converse were majorly appropriate. She also brought along a light wash denim jacket, the most casual of the denim jackets… but her huge timepiece still suggests she is a responsible young adult who knows how to keep track of time, lest we were fooled by her youthful outfit.